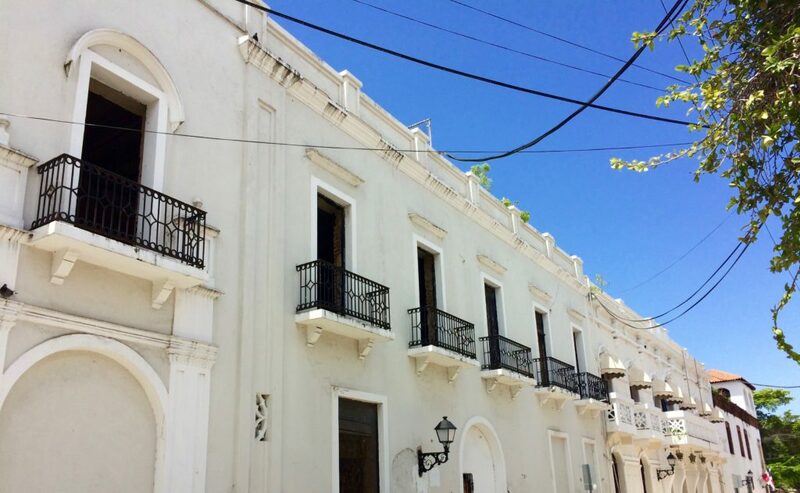 Unwrapping Santo Domingo’s Colonial Zone is best accomplished over time. Since we expected to be living in Santo Domingo for 18 months or so, neither efficiency nor coverage were top priorities on our first visit. We arrived without much of a plan beyond spending a sunny Saturday morning. 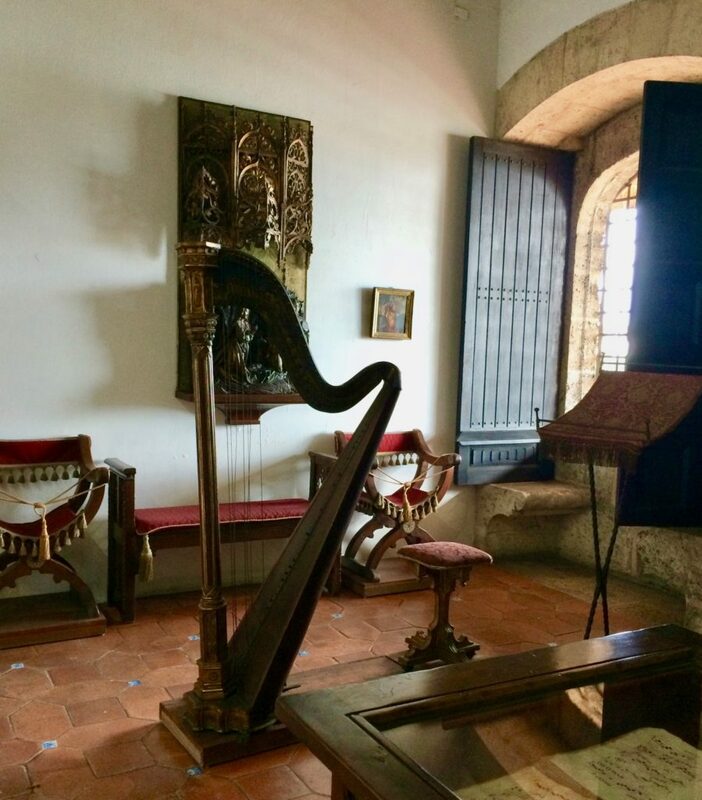 So, finding a great lunch, a wonderful chocolate shop, and poking around Calle El Conde (the main walking street) satisfied our initial desires. Around the edges, though, we gained a consciousness of the history that had taken place on every hand. As we strolled about, several men pestered us, offering to be our guides. One man had a name tag that made him look like he was associated with the government department of tourism and therefore trustworthy. We chose him. But when we asked what his fee for guiding us was, he waved the question away as inconsequential. He seemed to be saying that his services as tour guide were complimentary–paid for by the city. However, we got nervous when he kept saying “no worries,” “all included,” “think of me as family.” He spent about an hour taking us to the cathedral where we paid to rent self-guiding head-sets in English. We had a hard time getting rid of him and ended up paying him a thousand pesos just to leave us alone. 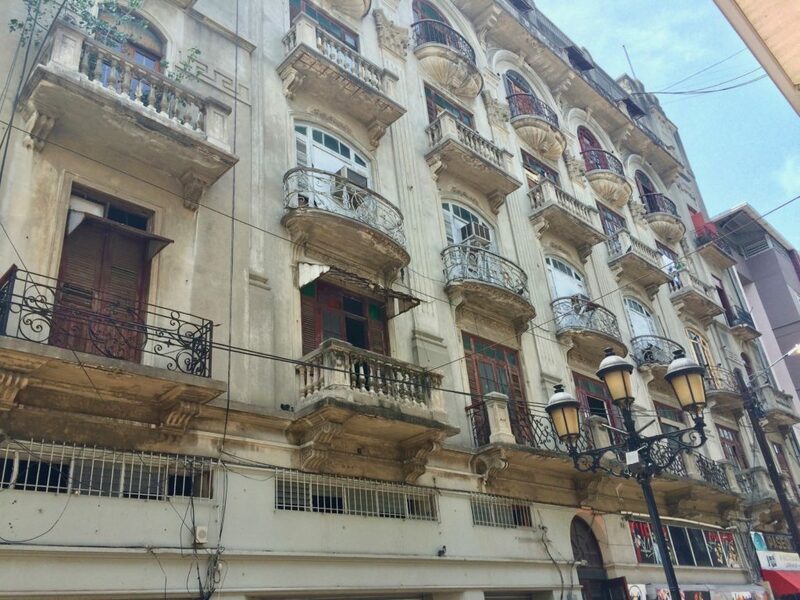 That’s when we knew our exploration of the Colonial Zone needed to happen with repeat visits and on our own terms. The photos I’m including here are meant to whet your interest in the beauties of the area, not to be a comprehensive outline. For our next visit we no longer had to puzzle about where to park our car. Take a taxi. There and home again. We also knew that discovering the history of the area was to be our top priority and came having done due diligence on the Internet. 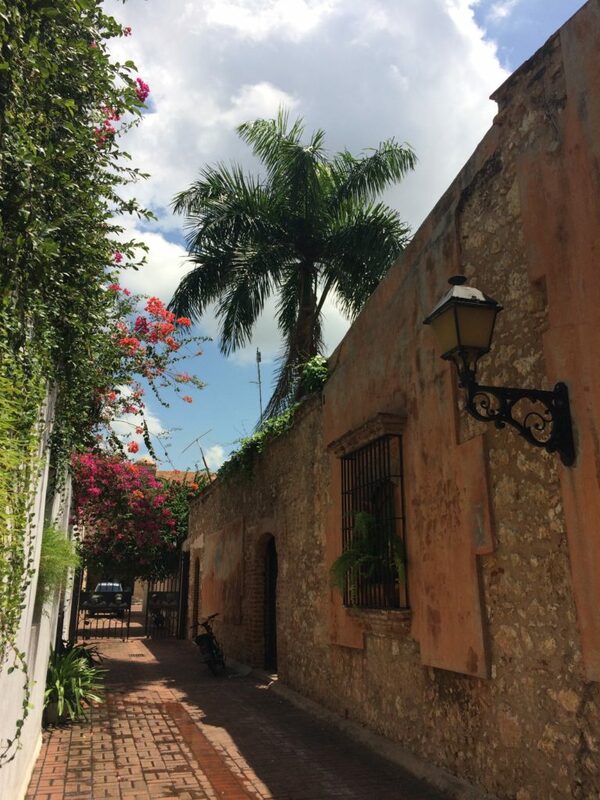 Be sure to check out the UNESCO website, since the Colonial City of Santo Domingo is a World Heritage site. 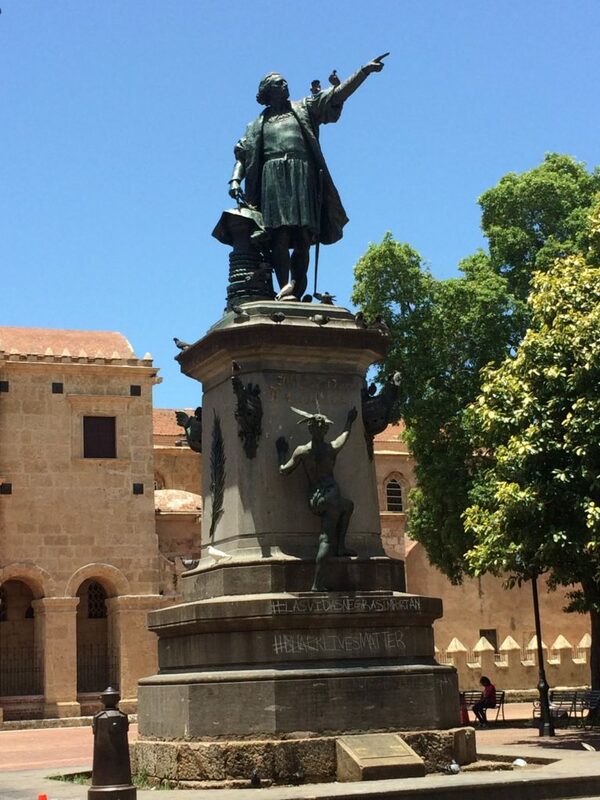 Did you know that Christopher Columbus stopped on this island he called Hispaniola in December of 1492 after his visit to Cuba? 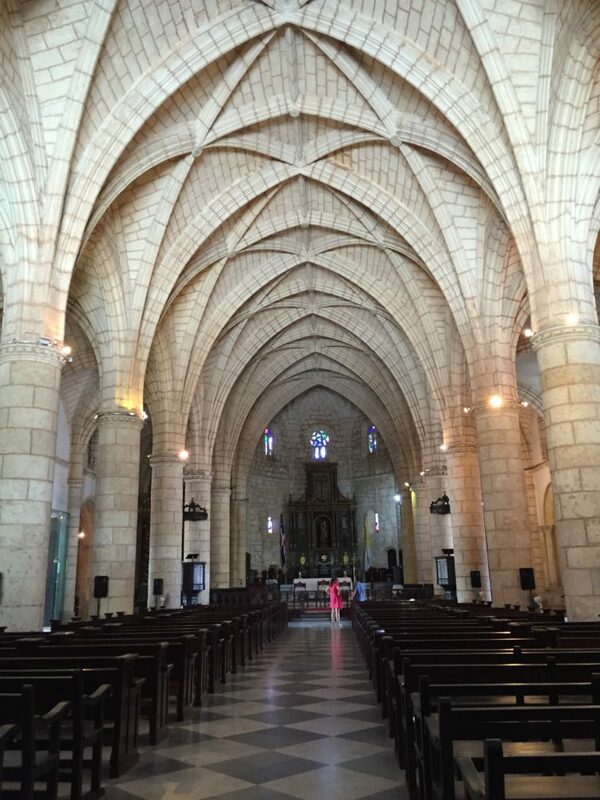 Santo Domingo holds both the oldest cathedral in the Americas (started in 1512 and completed in 1540), and also the oldest university in the Americas. 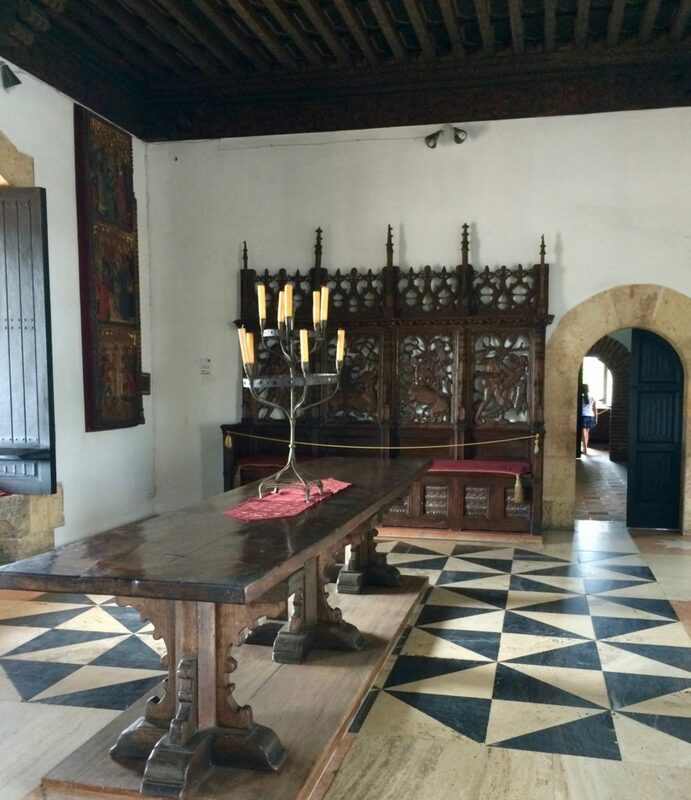 We were lucky enough to visit the Museo Alcazar de Colon, home of Christopher Columbus’ son, Diego, on a cloudy day with a breeze and very few tourists. The approach across the Plaza Espana was almost empty and I could see the Columbus Lighthouse in the distance just to the right. 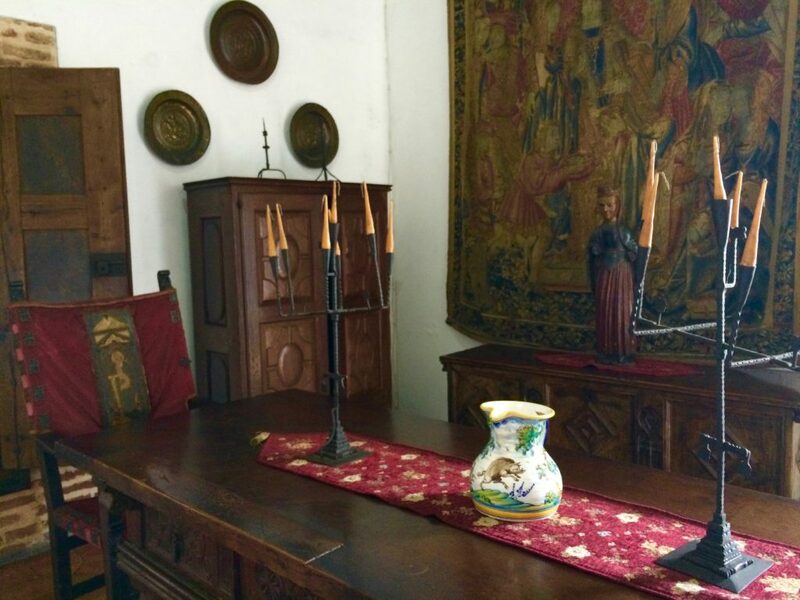 The home is open air all the way through and beautifully furnished with period-accurate pieces. 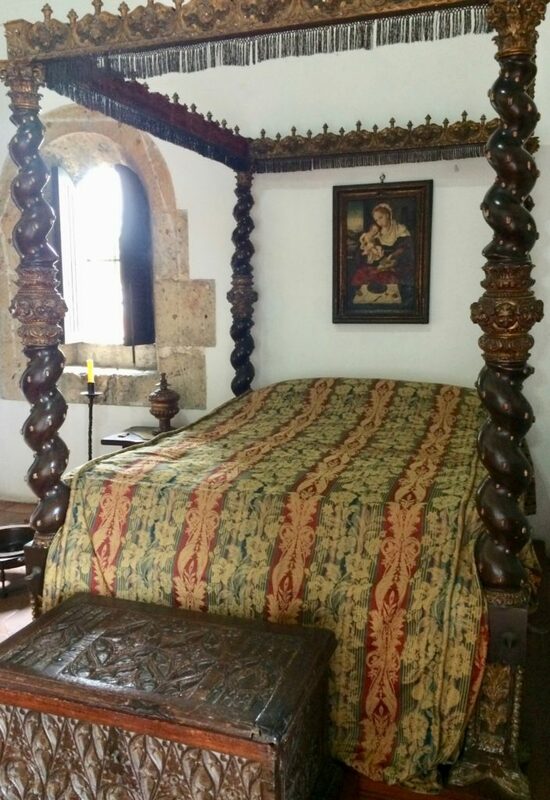 I couldn’t help wondering why Diego Columbus’ bed was so much longer than his wife’s, Dona Maria de Toledo. Was she simply a very short lady? 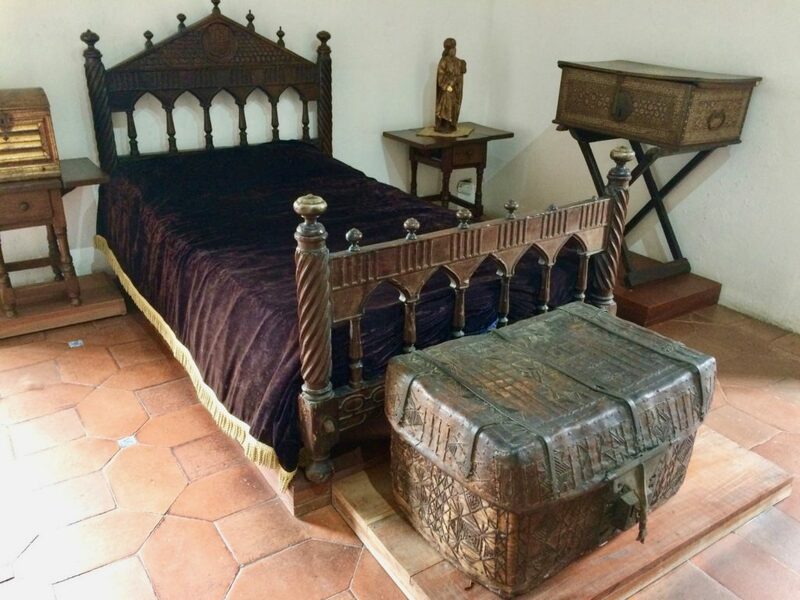 Actually, the reason for the bed-length difference is that aristocratic women customarily slept in a sitting position, supported by pillows, while aristocratic men got to sleep flat on their backs. 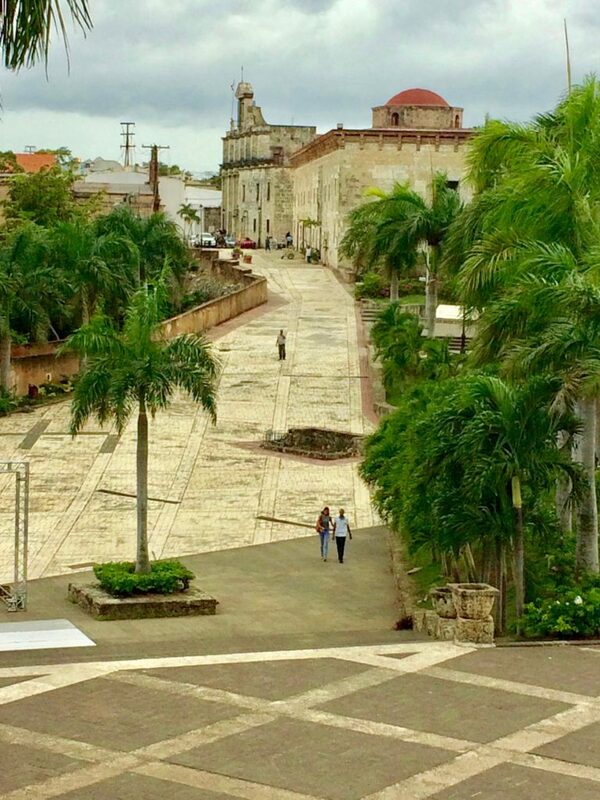 My favorite over-view of Santo Domingo’s Colonial Zone is the post called “Colonial Santo Domingo’s Best Walking Tour” on the Traveluster blog. The author breaks down the visit into 18 stops, well-documented by photos and brief notes for each site. My only disagreement with her experience is on Stop 17 about Parque Independencia. 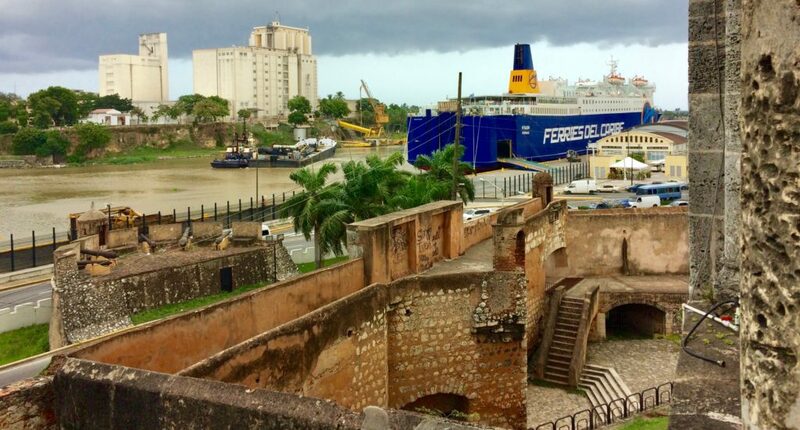 You’ll find my impressions of the historic area in my posts, “Walled City Begins at Parque Independencia,” and “Stand-off in the Colonial Zone of Santo Domingo.” For another good list of sites in the Colonial Zone, try here. Best advice: Download a walking-tour map and study it before you go. Wear comfortable walking shoes, wear a hat for the sun, and take along a large bottle of water.